Renewed fighting in Ukraine causes international alarm; Ukraine, observers say Russia moved tanks and broke ceasefire. Ukraine may face an imminent invasion from Russia over the next several days or weeks, according to both Ukrainian President Petro Poroshenko and international observer groups, less than 24 hours after renewed fighting broke months of calm along the border. "A colossal threat of renewal of full-scale military actions by the Russian terrorist groups remains," Poroshenko stated Thursday night, according to Ukraine Today. "Now on the territory of Ukraine, there are 14 Russian tactical groups with total number of personnel exceeding 9,000 servicemen. Concentration of the Russian servicemen near the state border is bigger by half than a year ago." "The military must be ready as much for a renewal of an offensive by the enemy in the Donbass [region including Donetsk and Luhansk, the two most prominent areas of fighting - ed.] as they are for a full-scale invasion along the whole length of the border with Russia," he added, noting that 50,000 Ukrainian servicemen have been deployed along the border. "We must be truly ready for this." International observer group the Organization for Security and Cooperation in Europe (OSCE) confirmed Poroshenko's statements Thursday night, according to the Wall Street Journal, noting that Russia-backed rebels moved heavy artillery toward Ukrainian government positions just before Wednesday's new outbreak in fighting. The rebels moved at least 12 tanks toward Maryinka, a Ukrainian town still under government control in Donbass which was the victim of heavy shelling on Wednesday, it said. Moving the tanks itself constituted a violation of the February 12, 2015 Minsk II ceasefire deal, which stipulates the maintaining of a ceasefire zone of between 50 kilometers (31 miles) and 140 kilometers (87 miles) between various artillery types; fighting broke out hours later. That zone had been maintained since March. Back to the battle lines? The sudden outburst of hostilities has caused alarm in the international community, and the UN Security Council is planning an emergency summit on the situation for later Friday, according to AFP. NATO chief Jens Stoltenberg downplayed the threat of an imminent war, but did caution that the Minsk II deal was likely on the brink. "What we see is increased unpredictability, increased insecurity, increased nervousness," Stoltenberg stated. Meanwhile, a war of words is already being waged between Moscow and Kiev, which have traded barbs and accusations of conspiracy since fighting began in November 2013. "The February 12 Minsk agreements are under constant threat of breaking down because of the actions of the Kiev authorities who are trying to avoid fulfilling their obligations to establish direct dialogue with the Donbass," Russian Foreign Minister Sergei Lavrov accused Thursday night. Russian President Vladimir Putin's spokesman further accused the Ukrainian army of "organizing" the provocations to be timed just before a critical EU conference set to extend sanctions against Russia until July. "No doubt these provocations are being organized by the Ukrainian army," Putin's spokesman Dmitry Peskov said. Wednesday's fighting broke months of relative calm along the Russia-Ukraine border, which exploded in hostilities last year following a series of political protests in the Donbass region from November 2013 to February 2014. Unrest initially began with the Euromaidan protests in Kiev, after thousands of Ukrainians protested over then-President Viktor Yanukovych halting a process by which Ukraine would take steps to join the European Union (EU) due to Russian pressure. The resulting unrest led to the 2014 Ukrainian revolution, the overthrowing of the Ukrainian government, and a swift sociopolitical change which saw Ukraine shift dramatically toward eurocentrism. Russia refused to recognize the new government and launched an invasion of the Crimean peninsula in March 2014, throwing the already-conflicted Ukraine into civil war. Pro-Russian rebels continue to fight in the Donbass region, consisting of Donetsk and Luhansk - two regions of Ukraine which have traditionally been associated with Russian language, history, and culture over the more European Ukrainian culture dominant in the country's northeast. The resulting conflict, which has now been named as the War of Donbass, has left 6,400 dead since April 2014, according to the United Nations. A full 770,000 Ukrainians have sought refugee status in neighboring countries. 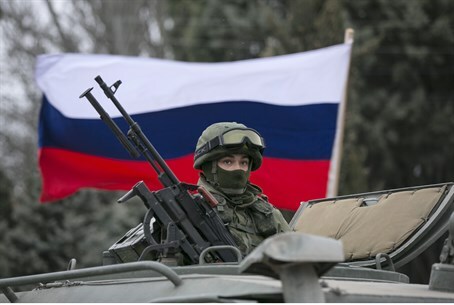 Controversy has continued over Russia's role in the conflict, as several 2014 estimates noted a heavy Russian military presence in the fighting - with estimates ranging from a 15% Russian military role to as much as 80%. Meanwhile, several comparisons have been made between the Ukraine crisis and the ongoing civil war in Syria, with Syrian rebels even offering the pro-Russian separatists advice during the height of the fighting.